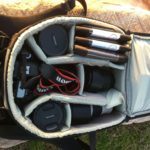 Let’s talk about my camera bag. I am possibly the least technical photographer you will meet (or if you are lucky you might not meet me 😊). More on that here. Over the years I have always got by with pretty much the minimum gear needed to do The Job. I don’t have, and never have had, gear-lust for the latest and greatest upcoming gizmos at all. To ‘do’ landscape photographs I have three bags. 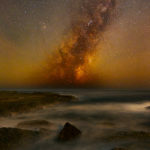 Specifically as I am talking about for Australian landscape photography / Australian panoramic photography, the bags need to be water or at least splash proof, sand-proof and dust-proof. I have three of them! So, my first bag is a LowePro Super-Duper Trekker or some such name, well discontinued, and it’s massive. 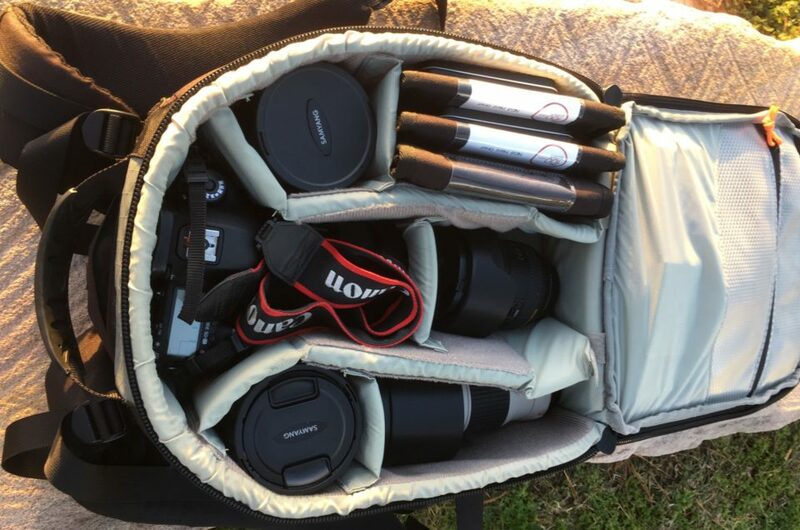 It holds 2-3 big SLR bodies, up to half a dozen lenses, and weighs a ton. But! I hear you say, you don’t have gear lust? 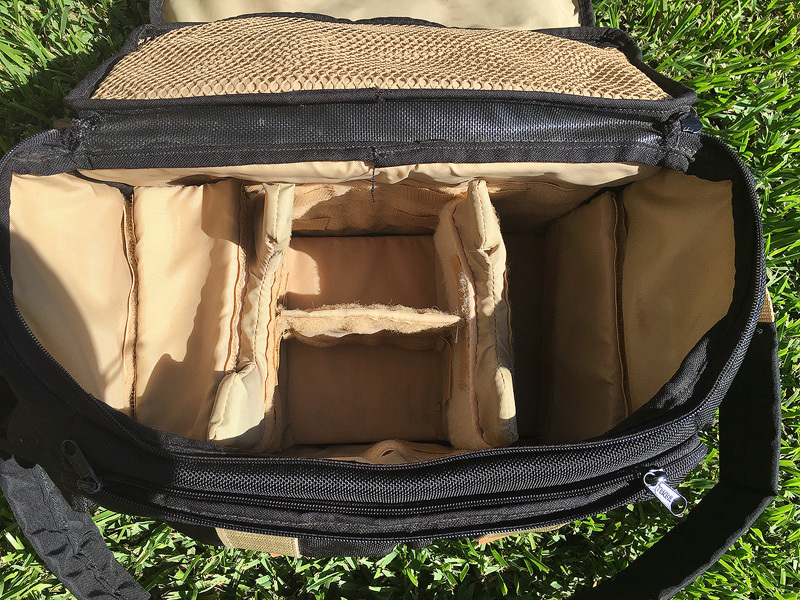 Yep – this bag is used for no more than storage. Doesn’t see the light of day – or indeed the stars of night! I used it when I was a wedding photographer all those years ago. Getting lighter, my main bag is again LowePro, again discontinued, and is a mid-size waterproof Trekker. It is big enough to take 1 SLR body with lens attached, and maybe 2-3 more lenses plus bits ‘n’ bobs. But! I don’t even shoot with this all the time. My go-to bag for walking and astro is a thirty year-old Tenba, which most importantly is a top-loader. 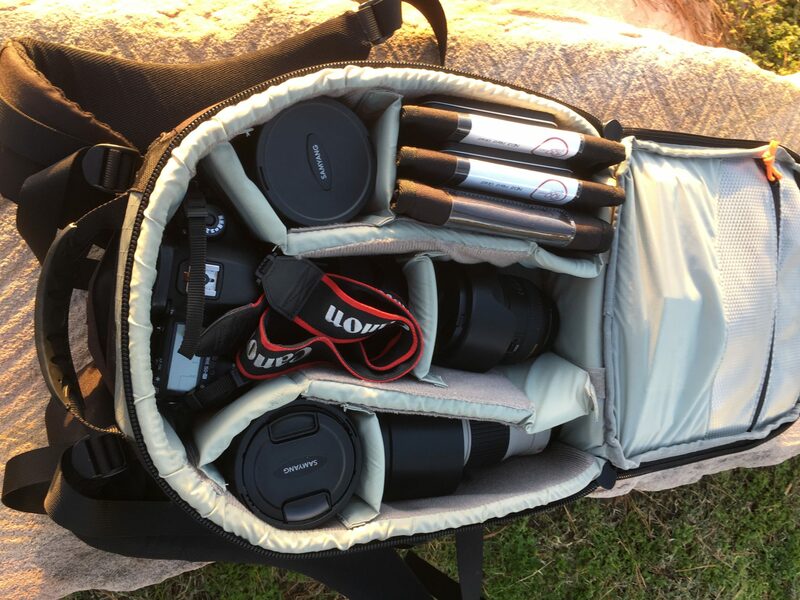 It holds one camera, two lenses, the filters I need for the particular shoot,and a few more bits. It gets the Job Done. I can shoot with all my gear on my back, so (sadly) I don’t need to worry about light-fingered people wandering and helping them elves to my gear by if I am entranced in another world through my viewfinder. What do you carry? I would suggest working from weight, not what you think you need. (My bag fully laden is between 8-9 kgs and that is too much for me.) That’s the other way round to most people, who put this and that and stuff it all in their bag. I have bought a few lenses (after putting off and putting off the purchases) recently and I have reached my limit. More importantly, I can carry 6 kg just about comfortably, anything above that and I risk pulling back muscles as I swing the bag onto my back. Yes, you will, in some instances be swinging your bag over your shoulder and on and off your back really quickly when the light is peaking and you need to walk 20 meters to a better shooting spot. I have the following main gear in my bag. My Canon EOS5D MkIII was an upgrade in 2012 from my EOS20D – that was a significant upgrade. It’s full frame and it’s a workhorse – that’s what I need. I’m a wide-angle guy, I need full frame. I still have the 20D, it’s pretty near non-working, but if I am on a trip, I take it as backup. Because I know it’s a risk I only have one body. First of all, my Canon 16-35mm F4 is my go-to lens. It replaced a 20-35mm F3.5 from the 90’s. I pretty much use it for everything terrestrial in my photography. 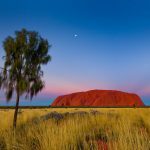 Top of my landscape photography do’s and don’ts list would be – do buy a Wide Angle! I read the F4 is better than the F2.8 as well, but the main reason I got the F4 version was that it is a lighter lens. The Canon 24-70mm F4 is my most recent purchase. I actually didn’t have a standard zoom for months. My old 90’s 28-70L F2.8 was my wedding workhorse and finally went ‘fuzzy’. So I didn’t have the 35mm to 70mm focal lengths covered for a while. This F4 is small and light. And sharp. Once again, the F2.8 variant is heavier, but it also has a bigger filter size. My Canon 70-200mm F4 is my luxury item. It replaced a bottom end dodgy 70-300mm F ‘Very High’ lens that was about as sharp as a bottle bottom. I am not really a telephoto kind of guy really. But – I am slowly starting to learn to use it. Are you seeing a pattern emerging about F4 lenses here? Lastly, the Samyangs are a recent luxury, and pretty much only used between March to October for astro. Awfully built, with brilliant glass. On the 14mm the horizon isn’t even straight! However, for Astro you need fast, and the 14mm is F2.8 and the 24mm is F1.4. I don’t use them much for anything other than Astro though as they are fully manual. Are you getting the idea I don’t replace stuff unless I really have to? You don’t need that new lens, really, just use what you have. 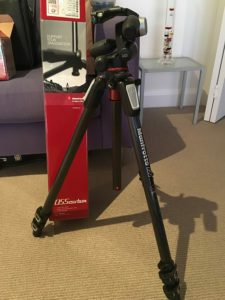 I also carry a Manfrotto 055CXPRO3. If, as I do, you are doing landscape photography prints for sale you seriously need to make sure everything is pin sharp. It’s quite a tall tripod which is also good for my weakening knees – stooping down isn’t so much fun for anything other than a couple of shots. I went for the three section leg version for extra stability, and carbon fibre legs for less weight. And! those carbon fibre legs are also warmer to the touch on freezing mornings. More on tripods here. So that’s it – it’s all about being lightweight, but functioning. Thanks for reading this far – now it’s time to walk… Where’s that camera bag of mine?